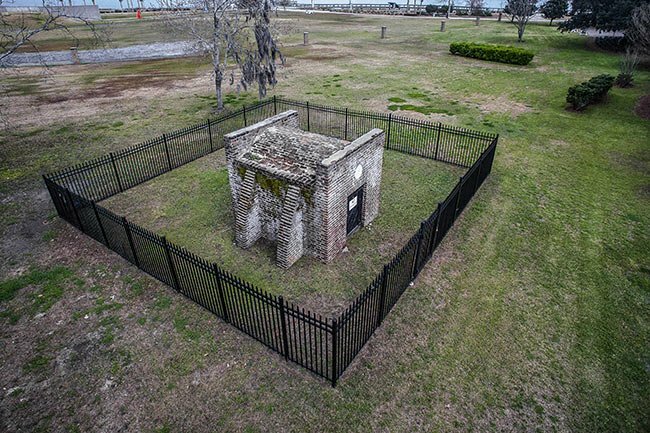 This small brick building within the Historic Officers’ Quarters District of the former Charleston Navy Base may be the oldest structure in the city, though its origin remains a mystery. Ominously called the Dead House, it is suspected to have been built prior to the Revolutionary War. 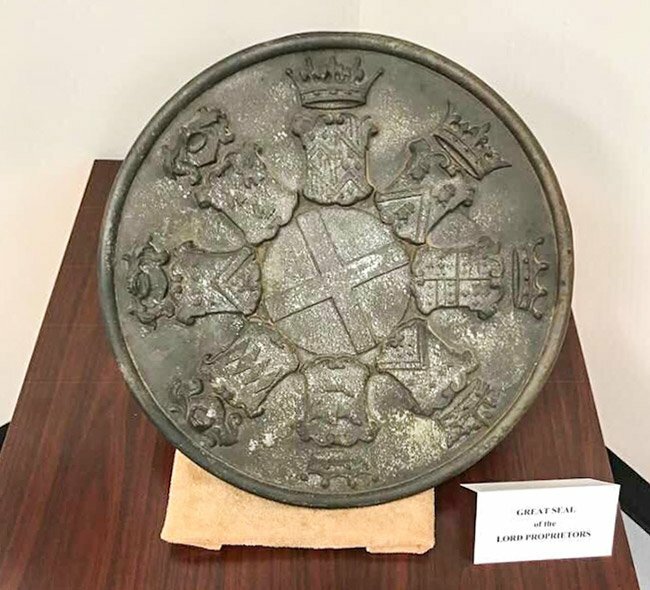 A bronze seal of the Lord’s Proprietors once adorned its entrance, lending to the idea that this building dates back to South Carolina’s colonial days. The seal has been removed, and the year it was placed above the door is unknown. When the property was surveyed in 1895 for the layout of Chicora Park – a public garden that was located here prior to the Navy Yard – “Dead House” was inscribed on the plat near the location of this small shed. John and Frederick Olmstead, who had been commissioned as the park’s landscape architects, opted to leave the building in place. By the time the Navy turned this area, which the Olmstead brothers had dubbed Oakland Ridge, into officers’ quarters, the phrase “Dead House” had become instilled in local lexicon. In fact it continues to grace this building of unknown provenance today. The Dead House’s brown bricks are laid in sturdy English bond, and its windowless design suggests it once served as a powder magazine, though no mention of it appears on any early list. It also features buttresses, which is unusual given the building’s small size, and these certainly imbue it with additional strength. Prior to the property’s becoming a public park, and later a navy base, this land was a plantation, and the answer to our puzzle may lie with one of the plantation’s early owners. 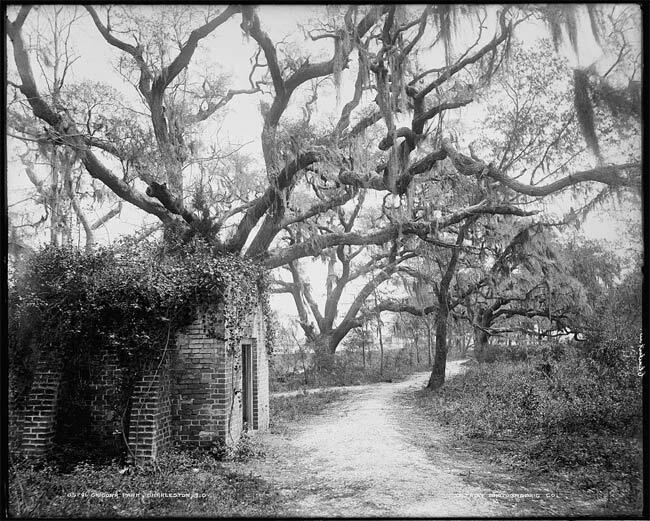 Land along the Cooper River made for fertile fields, and 15 different families planted this particular tract in the 200 years between the first land grant in 1672 and its purchase by the City of Charleston in 1895. Sir Egerton (also spelled Edgerton) Leigh owned a plantation here called Retreat Plantation from 1767 until 1771. It is Leigh’s profession that points to the theory that the Dead House was built as a powder magazine. Leigh served as judge of the vice admiralty in Charleston and at times dealt with cases pertaining to customs officers who assessed taxes on gunpowder arriving by ship. Leigh famously presided over the seizing of two ships which belonged to Henry Laurens – Leigh’s uncle by marriage – when the ships did not follow proper customs procedure. While Leigh attempted to compromise with Laurens by allowing the release of one of the ships, Laurens remained indignant and sued the seizing officer, George Roupell. The subsequent feud between Laurens and Leigh lasted for years. It is suspected by some that Leigh, a Loyalist, privately kept some of this powder at his plantation for the pending war. 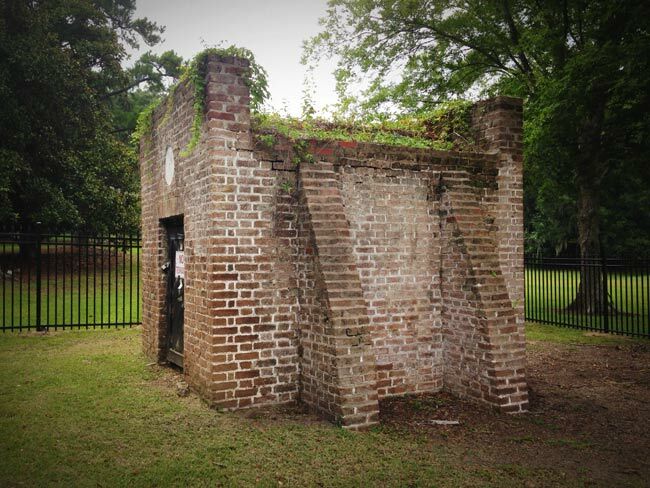 Others note the growing concern over storing gunpowder within Charleston itself. The city had grown more densely populated with each passing year, and the danger of accidental explosion may have compelled a facility to be constructed further from the city’s core. But how did the name “Dead House” arise? 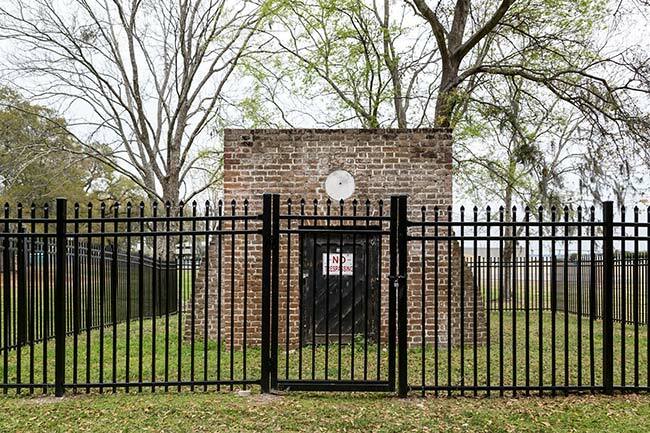 There are those who believe that although the building began as a powder magazine, it may have been used by subsequent owners to store dead bodies while they awaited burial in family plots. The sealed brick room would have been cool enough to help preserve corpses, a benefit which could have led to the building’s odd name. Until future evidence reveals the true history behind the Dead House, it remains a fascinating structure left to speculation. The Dead House rests in the vicinity of the Admiral’s House, also known as Quarters A.
Update: The seal of the Lords Proprietors was removed in the early 2000s when the Noisette Project, a now-failed redevelopment venture at the Old Navy Base, was underway. The City of North Charleston currently stores the seal in its archives and is in the process of trying to test its age. Initial results show that the metals used in it date from the Colonial era, but how early in the Colonial era is unknown. Was the seal cast before 1729, when King George bought out the proprieters’ heirs and South Carolina became a royal colony? After testing, a replica of the seal will be made and placed on the Dead House in order to protect the original from vandalism or theft. I believe the “Dead House” was a mausoleum. Perhaps, Sir Egerton Leigh, knowing that he would eventually return to England, had it built to house any family that died during his time in Charleston. After, he could take his dead back home with him without having to unbury them. It seems too small to be an armory. Very well researched and feed me more. I have another sturdy English bond that needs researching.